A rural country-style dream house strengthens family ties to Acadiana for a couple planting roots. The Johnsons selected antique heart pine wide plank flooring throughout the home|! !| with the objective of a relaxed country feel. An artist|! !| Karen selected the accents and décor to mirror their laid-back lifestyle. 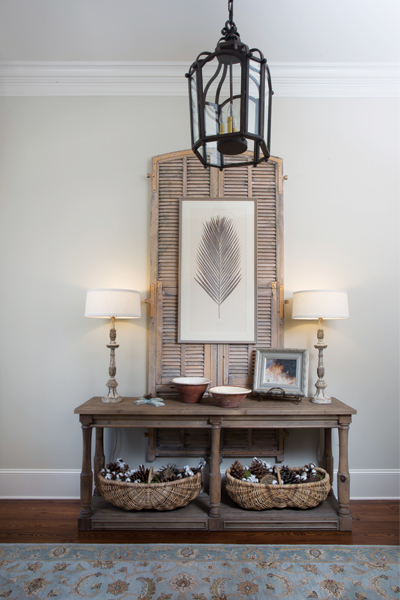 The entrance foyer is adorned with a framed pressed palm and baskets filled with cotton and pinecones. The secluded family property, momentarily illuminated by the tiny lightening bugs whose intermittent flashes signal availability for potential mates, would be the site of the newlyweds’ dream house. The serene setting spoke of a familiar natural beauty that was close to Karen’s heart. Ever since childhood, she had taken long walks and bike rides along that same winding road, but had somehow missed this perfect spot. Karen grew up further down the street, just beyond Lafayette’s edge. It was once flanked by untouched fields stretching for miles, purchased by her great-great-grandfather long before her time. Family members later built homes on the contiguous tracts. Some still reside there, including Karen’s father, her adult children and their children, various aunts, nieces and cousins. Karen had five grandchildren residing nearby. Keith had five grandchildren of his own. So the design of their new one-story 3,300-square-foot home, completed in 2013, would include a covered outdoor living room equipped with antique brick flooring and a large fireplace, and an outdoor kitchen area. A dining porch would be just around the corner. Several other deep wrap-around porches were added to enhance their new open-air country lifestyle. This included a more elegant front porch with ample seating. Hefty concrete columns, generous French doors with custom board-and-batten shutters, slow-spinning ceiling fans dangling from a tongue-and-groove wood ceiling painted sky blue “to keep the wasps away,” and flickering gas lanterns completed the laid-back Southern vibe. Karen’s unique bottle collection decorates the dining room, furnished with an antique farm table and church pew. It connects to a large butler’s pantry equipped with a bar sink and an ice maker, then the kitchen which is flanked by a second, larger pantry. Venetian plaster was placed over the brick fireplace surround in the den to create a subtle finish, notes builder Gayle Carmouche, president of LaFosse Construction. “Gayle’s like family now,” says Karen. The Walker Zanger tile used for the kitchen backsplash compliments the ice blue leathered granite-topped island. An elliptical brick arch opens onto the living room. The serene master bedroom has antique pine beams and an antique cypress barn door opening to a sun room. The master bedroom is equally serene, fashioned with antique pine beams and center-match pine boards covering a lone wall for that subtle country effect. An antique cypress sliding barn door was installed; it leads into the sun room that opens onto the spacious outdoor living area overlooking an expanse of trees. The master’s center-match pine board effect was repeated in the two guest rooms, which also lead to splendid porch views. Since Keith’s work requires time in Texas, he was reluctant to leave Karen with the lion’s share of tasks at the onset. So they approached Gayle Carmouche, the award-winning owner and president of LaFosse Construction, to handle the project. Her reputation as a builder of high-quality custom homes with superior craftsmanship was just what the Johnsons needed. The design of the house is firmly tied to the land around it. A wall of windows surrounding the living room provides a sweeping view of the tree-lined property. Another panoramic view is provided with a multitude of windows in the smaller, cozy den. Deep window seats, a fireplace that stays ablaze most winter evenings, and the overstuffed chairs serve as enticements for watching movies or taking in good books and afternoon naps. Center-match pine boards were butted together on walls in the guest bedrooms, adding to the casual country aura. Each of the three bedrooms open onto a variety of generous porches that surrounded the house, all with splendid views of the tree-lined property that’s been in Karen’s family for generations. The master bedroom suite has a sunroom that’s adorned with an original George Rodrigue Blue Dog painting. It opens onto a huge covered outdoor living room and kitchen with a fireplace. Favoring a soothing neutral color palette, Karen decorated with an understatement, using rustic forms and natural elements. She worked with interior designer Leigh Blakeman on the material finishes and color selections, and was assisted by Kim McClaine on the remaining interior décor tasks at hand, including the furnishings and accents. “Karen is very artistic. She has an eye for color,” Gayle stated. When detailing, Karen seemed to find just the right touch for the smallest spaces. She placed baskets of pine cones and cotton on a table in the foyer, above which a lone, hand-pressed palm was framed as a demure centerpiece on an unpainted shutter. This minimalist botanical touch was repeated in the formal dining room as a pair of pressed elephant ears, and placed above a weathered church pew. The room is rarely used. “We usually eat around the kitchen island or outdoors,” Karen revealed. For the utility/laundry room, she installed a Dutch door (the top swings open separately) after giving it an antique finish, to keep her little Yorkshires, Lucy and Ricky Ricardo, safely tucked away when company comes over. The subway tile backsplash and granite countertops give the otherwise functional space a polished look.